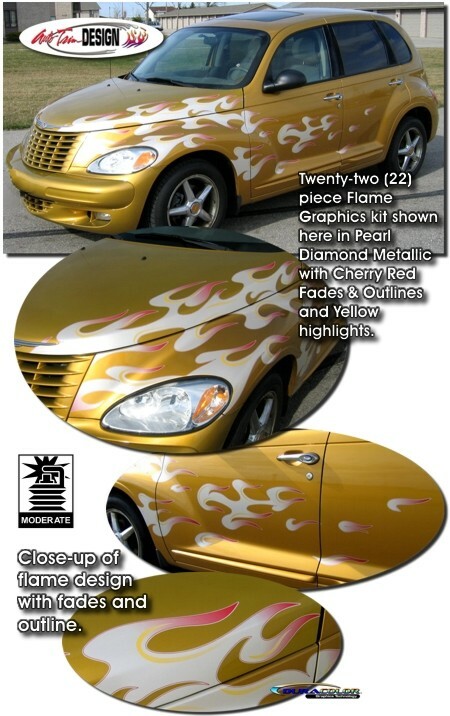 "Flame-Up" your PT Cruiser with this awesome twenty-two (22) piece flamed graphic kit! Flame graphics feature a light outline & fade to the rear of the flame tips as well as inset highlights as shown. Choose from a wide variety of base, fade and highlight colors. Graphic kit is specifically made for 2000-2010 Chrysler PT Cruiser (Coupe or Sedan) and will not fit any other vehicle. These easy-to-install graphics are HOT! Easy to follow online general application and care instructions are included. Please Note: These graphic require trimming after installation is complete. Due to the compound curves of the Hood and Front Fender area, Hood Flame is a little difficult to install. Professional assistance may be necessary.